Last week I bought some glucose to use in a recipe I saw on Martha Stewart’s website — Blueberries and Cream Cookies. Glucose was not something I’d expected to see in a Martha Stewart recipe, but her guest that day was a pastry chef at New York City’s “Milk Bar” where they make a variety of unique cookies with interesting ingredients. According to the chef, glucose syrup (which seems to be more common in UK based recipes)gives cookies a better mouth feel, which in the case of the the Blueberries and Cream Cookies was a cookie with hard yet crispy edges and a dense, heavy center. I didn’t care too much for the flavor of the blueberry cookies, but I loved the texture and tried to duplicate it in chocolate chip cookies by using glucose instead of some of the sugar. The results were what I’d hoped for — a heavy cookie with very crispy edges and a dense center. It had a commercial texture to it, but the flavor of homemade. Another thing I noticed was cookies I baked yesterday tasted fresh today, so I think the glucose might act as a preservative. So if you happen to have some glucose in the house (???) or feel like picking some up in the cake decorating aisle at your local craft store or cake decorating store, you might want to try recipe. I’m still in the process of testing the cookies out on real live people to see if they can tell the difference. Cream the butter, both sugars and the glucose using high speed of electric mixer for 2 minutes. Beat in the vanilla and the egg. Scrape sides of bowl and beat in baking soda and salt. Scrape sides of bowl again and stir (by hand or using lowest speed of mixer) the flour. Stir in the chocolate chips. Chill dough for a couple of hours or overnight if you have time. Shape the dough into 10 large mounds. To get the bake-time right, you might want make just a few rounds at a time. Set the dough mounds on parchment lined cookie sheets and press down slightly. Bake in a pre-heated oven at 325 F. for 16-18 minutes or until edges are brown. Centers will look sort of pale, but they will brown as they cool. Cool on cookie sheets for about a minute, then transfer to cooling rack to cool and crisp. Thanks for sharing your results on the blueberry cookies! Anna-I had the exact same results as you with the Blueberry cookies. Perfectly crunchy outside texture and creamy soft inside day one and then overnight mine turned soft all the way through, but still delicious! It is 90 minutes long. The first half is descriptive and historical and the second half is the biochemistry. I am planning to switch from cane sugar to glucose for all of my baking after having seen it. Thanks so much for this tip, L! I am going to post it in its own post on Cookie Madness so people will see it. This is so cool! I would love the flavour of homemade with the freshness of packaged. It it has preservative qualities, this is a great idea to try with cookies for shipping. I love baking, but can’t have the stuff sitting around the house while we’re on this crazy diet; so I’ve been thinking of doing some baking and shipping the product to friends and relatives for a mid-winter pick-me-up. Any idea how the glucose would do in bars or other baked goods? It’s kind of like a thick gel — much thicker than corn syrup and kind of rubbery and sticky. As for chilling, I did the cookies both ways, unchilled and chilled. The chilled cookies came out a little bit thicker, but not by much. Not having purchased Wilton’s Glucose, I assumed this was granular glucose, but reading a couple comments leads me to think it’s the liquid version. Which is it? From what I’ve been reading, the granular form is available at home brewing stores. And, Anna, did you chill the cc cookies before baking? I’ll try this sometime soon. Hi Anna–this is too funny. I made the blueberries & cream cookies today & LOVED them. I did not, however, read the comments after your post before I made them. What I DID do was immediately start thinking about how I could use the glucose in–of course–a chocolate chip cookie. And then I popped over to see what you were up to, and YAY! Will try them next week . . . Thanks for trying the blueberries and cream cookies. I think you and I had the same opinion about them. About the glucose, it was much thicker than corn syrup and weighed a lot more per volume. I think a quarter cup weighed aobut 90 grams. But I think corn syrup would still be a decent substitution. Also, I noticed these cookies lose their crispy edges after being stored overnight in a tin. They’re still delicious, but soft. Thanks, Anna. This might be the answer to the question I asked back in December on ideas to keep the chocolate chip cookies I was making for Christmas gifts fresh as they made their way to the recipients. I was using lecithin, but I will definitely try the glucose. Thanks for posting this! I am always seeking to make bakery style cookies but mine always just taste homemade. Good, but homemade. After trying a million variations on ccc’s, this is the first one that I have seen with a unique ingredient, one I have never worked with before. I hope they have glucose at our local Michael’s. Can’t wait to try them! Ooh take a picture! They sound great. Are they nice and pretty like large bakery cookies? I encourage everyone to read about it on their own, but I can tell you it adds a different texture to cookies :). Mary, you’d have to Google glucose vs. sucrose to get a better answer because I couldn’t tell you. But considering you’re only getting about 1/2 teaspoon in each cookie, it’s not anything to worry about. It’s probably best to just eat half a cookie and a good bit of protein to soften the blood sugar rise. I have to eat cookies with or right after some sort of protein or I feel the blood sugar spike and what I’m guessing is the insulin rise and, oh, the shakes. It doesn’t matter what kind of sugar they’re made with, though I’m hoping the coconut palm sugar and agave versions might help. Corn Syrup is a type of Glucose. Some recipes use them interchangeably although Glucose can be derived from other things besides corn. Is glucose metabolized by the body more easily than sugar? I was just wondering, because I always though it was a more ‘simple’ sugar that was broken down quickly and could spike your blood sugar. It doesn’t make the cookies “smooth and elastic”. I believe that they are referring to the texture it gives gum paste since glucose is an ingredient in gum paste. I keep eating the cookies too soon to test the preservative theory, but I know they tasted fresh on day 2. 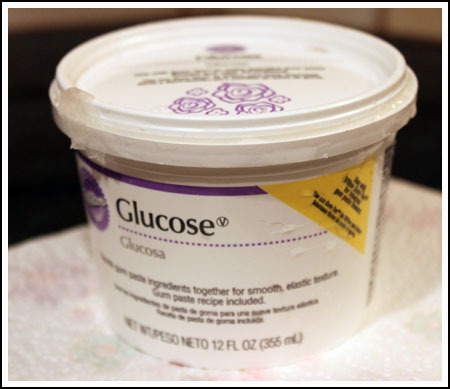 Very interesting….glucose…I have seen that in the baking aisle at Michaels and wondered what you would do with it…now I know! 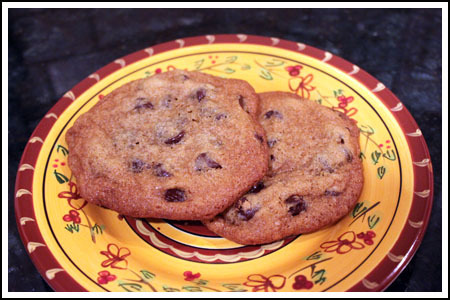 That cookie, actually sounds like my favorite kind of chocolate chip…love the crisp edges and the softer center! From the photo, I see the container says something about “smooth, elastic texture”. Hmmm… Not a quality I’ve tried for in cookies, but Chocolate Chip Cookies with a little “shelf life” would be a good thing, as Martha says. Oh, and what is the glucose like–corn syrup? Would corn syrup be a substitute to try? Just wondering. I love that–still waiting to test the cookies on real live people. So so far you’ve only tested them on fake people? Sounds interesting! How much does the glucose cost?